A cosy get-together with our top drivers, bonding over free food, lucky draw, fun activities and more! Our first huddle will be on 28 Feb 2019, 630pm at Grab’s Marina One office. To get to know our loyal supporters in person and thank them for their active contribution to our carpooling movement! 1. Lucky draw! Huat ah! 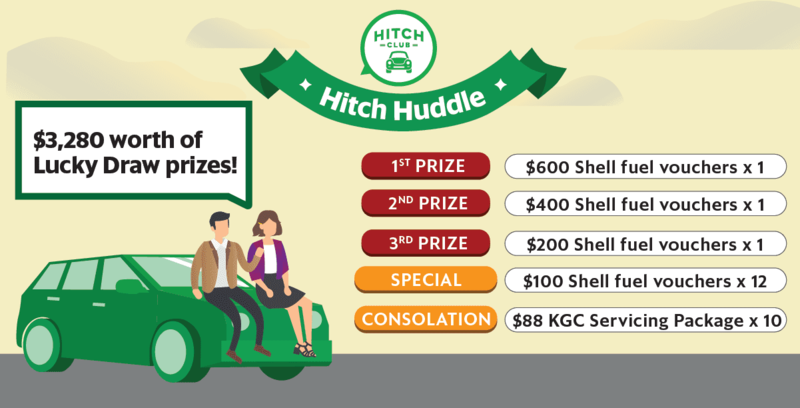 *To be eligible for the lucky draw, you need to register your Shell Escape Number here for the Hitch Club programme (you need not register again if you have done so previously). If you are not a Shell Escape card member yet, just visit any Shell station to get your Shell Escape card. Shopee discount voucher, and more! Get an insider peek to our beautiful Marina One office, typically only open to Grabbers, i.e. Grab staff but we have gotten this access just for you! Don’t worry, we won’t let you go hungry. With pre-dinner refreshments and a 11-course buffet spread waiting for you, come and have your fill! 5. Lastly, it’s all about the Huddle! Get to meet the faces behind Hitch, hear from the management and share your feedback with us! 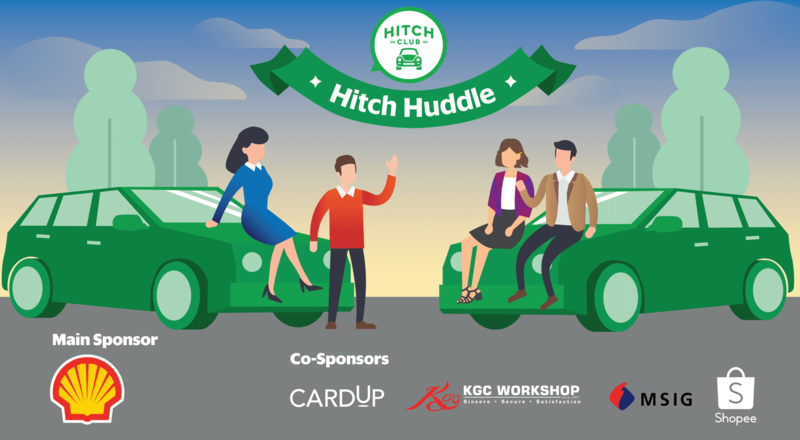 Plus, you get to network with fellow Hitch enthusiasts too. Glad you asked! Before you fill up the RSVP form, please make sure you are able to make it for the event as per the following details. All good? Now, get ready to be amongst the first 250 drivers to submit your RSVP here when the form opens on 1 Feb, 12 noon sharp. Note: only complete and accurate submission will qualify. How do I know if I’m one of the first 250 drivers? Within 3 working days after your RSVP, you will receive a SMS to confirm your successful registration. More details will be released leading up to the Huddle date, so stay tuned! How do I get to Grab’s Marina One Office? 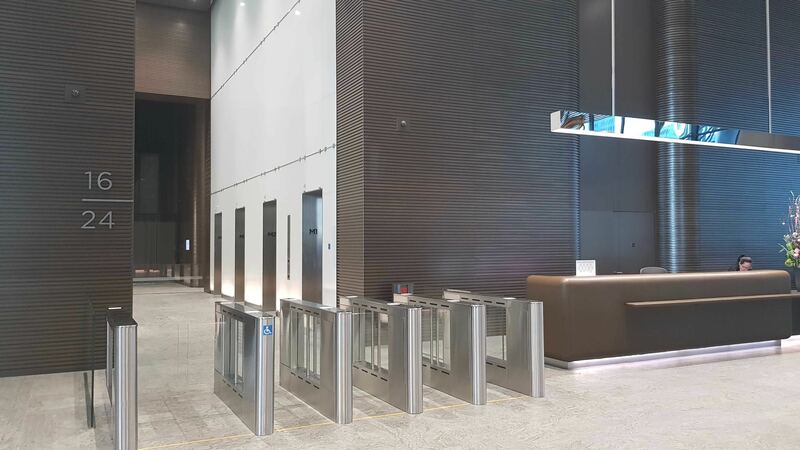 Look for the West Tower lift lobby, take the lift to Level 3 and find us at the Concierge counter. If you alight at Downtown Mrt Station(Blue Line), take Exit F and walk 5 min to Marina One West Tower. If you alight at Marina Bay Mrt Station(Red Line), take Exit I and walk 5 min to Marina One West Tower. Take the escalator to Level 3 and find us at the Concierge counter. Take 10, 10e, 57, 70, 75, 100, 107, 128, 130, 131, 131a, 162, 167, 167e, 186, 196, 196e, 656, 660, 663, 665, 700, 850e, 951e, 970, 971e and alight at One Raffles Quay. Walk 550m (about 6 min) to Marina One West Tower.